“Wake Up” uses the rabbit hole in “Alice’s Adventures in Wonderland” from the first dialogue between Neo and Morpheus in “The Matrix” as an introduction, so that the audience enters a surreal world, and interacts with it. It tries to explore the interactive design direction of VR animation, while allowing the audience to think of the concept of virtual reality. In the future, when virtual reality is really blended into the daily life of people, when human beings gradually become a mechanical organism, ideas and spirit are not bounded by the flesh, where will we go to? CAFA ART INFO: First of all, congratulations on your scholarship! Please talk about your experience of winning. Ji: In general, I am very happy, because I am recognized by the students and teachers, and I was satisfied when I was making this graduation piece. Although it was hard, the new sensory experience of VR made the production process more interesting than the traditional three-dimensional animation or special effects production, especially the UE4 engine that was introduced in the production process, which really made my production process smooth and quick, and everything in my mind could then be completed. CAFA ART INFO: First Step Award is an important prize from the academy, what makes your work stand out from all the entries? CAFA ART INFO: There are many different images in your work, for example outer space, animal, city, etc., and these images constitute a surreal picture. Why did you choose to arrange these images in your work? 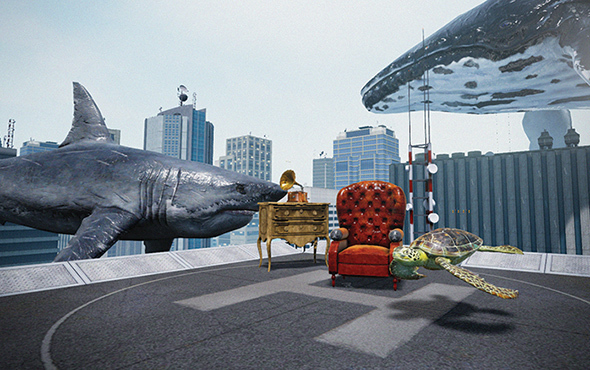 Ji: Well, when I first came into contact with VR technology in 2014, the picture of the film entitled “The Matrix” immediately appeared in my mind, and I was afraid that the terrible times would then arrive so I selected the scene that Morpheus cited in the story of “Alice’s Adventures in Wonderland” when he first met Neo in “The Matrix”. The second scene and the third scene are themed on the contrast and collision between large-scale biological themes and modern science and technology, in fact, the film special effects industry preferred to create big things with a sense of volume over the two years, because I have studied three-dimensional animation and special effects in my undergraduate study, I am more interested in this. In fact, it was very experimental, because it was the first time for me to use VR technology for an artistic creation, without any experience in many aspects, the experimental and tentative are more obvious, rather than being mature and complete. CAFA ART INFO: The most interesting thing for VR technology is to make the work and the audience interact. What kind of interaction do you want between your work and the audience? What do you want your work to convey to the audience? Ji: First of all, I think VR interactive experience must be straightforward, from the technical perspective, when I learned VR technology, I also experienced a lot of other VR works, the majority of which make people dizzy so that the human to computer interaction experience was bad, while the frame rate and response speed was critical, so I focused on this problem in the production process. All the designs and interactive actions are first based on the rapid response, only when the audience has a smooth and quick sense of experiencing it, will they think of what you want to express. I simply hope to convey something that allows people to consciously understand the confrontation and contrast between the biological and industrial nature, because it is easy for people to live in inertia, and the long-term adaptation will make them numb, and then they miss the sense of capturing the subtle feelings and experience, and I want people to pick up the consciousness of subtle feelings through my work. CAFA ART INFO: What difficulties have you encountered during the creative process? How did you solve them? Ji: I think technology is the biggest difficulty, because I am extremely obsessed with technology and I often start from the technology when I am interested in something, because there are few friends who know VR technology, I have to personally finish the work, and the whole production process is actually a process of self-learning and practice, so there was stagnation and repeats, which are caused by technical problems. There is not any other way, except for constantly looking for tutorials and reading the official technical documents. CAFA ART INFO: Do you have any plan for your future artistic career? Ji: I have a direction in my mind, and I will stick to it, but the first thing I have to do is to finish the thing I have to do, and no day can be wasted, I must maintain the state of passionately studying new technology, constantly learning and understanding, and avoid losing the joys of new things ….